VLMK ENGINEERING + DESIGN IS A DESIGN FIRM WITH A FOCUS ON STRUCTURAL AND CIVIL ENGINEERING DESIGN AND PLANNING FOR THE DEVELOPMENT COMMUNITY. At VLMK, we deliver pragmatic, expert solutions to a wide range of clients, both as subconsultants and prime consultants. Our expertise covers both engineering and design services. We are a multifaceted team of trustworthy and genuine professionals with a wealth of knowledge and skills, driven by a relentless focus on the success of our clients. Our enduring success is the result of our commitment to honorable business, hard work, and excellence. We’ve been around the block more than once. Our work across a wide range of market sectors and construction materials is always backed by proven methods that maximize your efficiency and save you time and money. We work hard to deserve your trust: we’ll always tell you the truth and guide you safely. You can always expect authenticity, integrity, and excellence, no matter the circumstances. FOUNDED IN 1971 IN BEAUTIFUL PORTLAND, OREGON BY FRED VAN DOMELEN AND DIRK LOOIJENGA UNDER THE NAME VAN DOMELEN / LOOIJENGA CONSULTING ENGINEERS. The firm shared a two-room office space with an interior designer, then was later headquartered in an old house in a hippy neighborhood near the Ross Island Market where the staff were arguably the most serious-minded residents of the community. The primary emphasis of the firm at that time was providing quality consulting structural engineering services. Fred was actively involved in the local structural engineering community and was at the forefront of developing tilt-up building design when it was first being pioneered. Dirk believed that the simplest solutions were often the best ones, saving the owner and contractor money. His common sense approach and easy-going manner were well-loved by those he worked with. Professional services were expanded in the early 1980s to include civil engineering and a broader range of planning and design services for industrial site and building projects. Roger McGarrigle and Jim Knauf became partners. Roger brought our firm into the computer age, and Jim offered practicality and simplified design that was respected by architects. 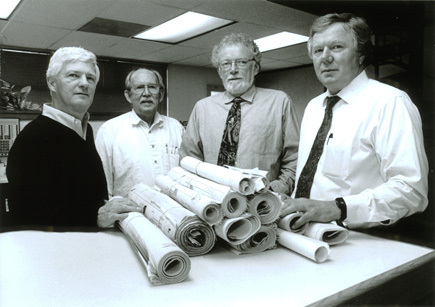 Following Dirk Looijenga’s retirement in 1995, the firm’s name was changed to VLMK Consulting Engineers, Inc. New principals Greg Blefgen, Havlin Kemp and John Brooks, as well as Chris Palmateer, Kevin Kaplan, Jason Sahlin, and Trent Nagele joined the management team at various points in the firm’s expansion. With the strong foundation given to us by our founders, the firm continues to grow and look to the future. When VLMK embarked on updating our brand in 2015, we wanted a creative visual representation of the tenets and values of the firm. We utilized the plumb bob, an ancient tool used to determine if a vertical wall or surface is plumb, as a symbol of justice, integrity, honesty, fairness, and truth. The plumb bob sits perfectly within the heart of our logo mark at the center of the V, for the last initial of VLMK’s founder, Fred Van Domelen.